Work at the collected trot to teach your horse to engage his hindquarters. Q: When I do flying lead changes with my gelding, Jazz, he only swaps with his front legs. I realize now that I tried to teach him to do flying changes the wrong way, and that’s probably what caused this problem. Is there any way I can re-teach him so he’ll change his lead behind too? A: Rather than a clean change, Jazz is cross-cantering: He’s on one lead in front and on the opposite lead behind. I’m assuming you’ve either allowed him to trot a step behind to complete the change (called “skipping”), or you’re doing a hasty simple change as a quick fix. Either way, Jazz has learned through repetition that 50 percent of a flying change is acceptable. 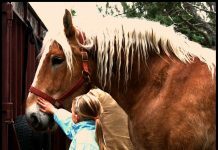 It might be frustrating at times, but horses like Jazz can be re-schooled. First, dedicate certain days to flatwork that will prepare Jazz for flying lead changes. Assign other days to jumping. Integrating your struggle with flying changes into your jumping sessions can end up souring Jazz’s attitude toward the jumps. At least for now, keep the two activities separate. If you happen to land after a jump and need a lead change for an upcoming turn, calmly do a simple change. Next, address Jazz’s flying lead change problems in your flatwork routine. For instance, I suspect that one reason he only swaps in front is because when you ask for a lead change he dives onto his front end, particularly his inside shoulder. To help him remain balanced, so that more of his weight is carried by his hindquarters, work on downward transitions that are preceded by half-halts. Another reason Jazz only swaps in front is because he’s not engaging his hindquarters; they’re merely trailing behind his front end. Work at the collected sitting trot so he pushes himself forward with his hindquarters. Lateral (sideways) movements will encourage him to move his hindquarters away from your leg, which is vital if you expect him to ever swap his leads behind. 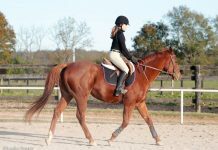 A fun, productive exercise is to leg-yield him on and off the rail at the walk and trot using primarily half-halts and leg pressure. The half-halts will keep Jazz at an appropriate speed while pressure from your leg will move his body (shoulders and haunches) laterally. See if you can avoid steering him with direct rein aids. These are just a few suggestions, but until you can effectively communicate with Jazz via subtle aids, he’s not educated enough to perform flying lead changes. The final piece of advice involves your riding. 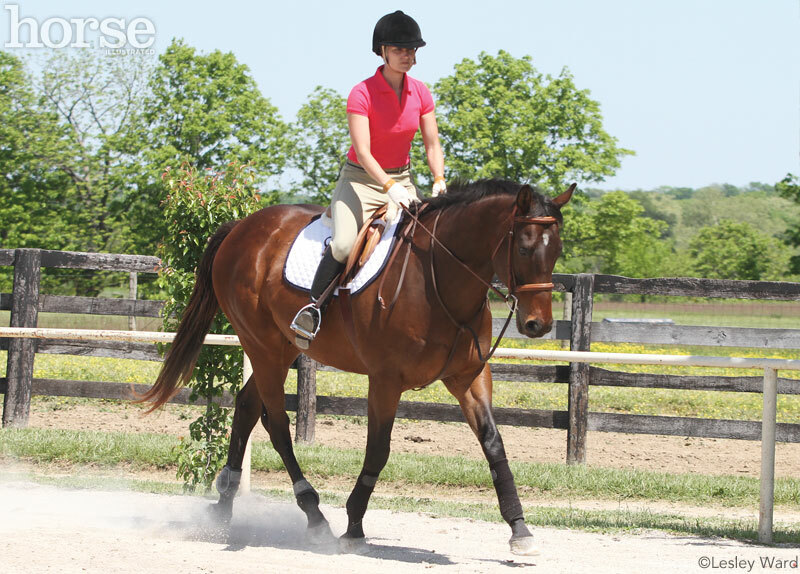 Like many riders, you could be contributing to Jazz’s lead change issue without knowing it. For example, you could be leaning into the turns with your upper body, which allows him to switch onto the new lead with just his front legs. You might also be using only your outside leg (perhaps furiously) in an effort to shove Jazz onto the new lead. Instead, you need help from your inside leg. When placed at the girth, your inside leg reminds Jazz to stay straight and not change any leads until you ask. A coach with experience in teaching flying lead changes would be a wonderful mentor for you. With some good coaching and your obvious enthusiasm, I’m sure lots of clean changes are in your future. During her lengthy show career on the hunter-jumper circuit, Cindy Hale won more than 20 medals for hunt seat equitation. She currently serves as a judge at local and regional open horse shows. This article originally appeared in the January 2015 issue of Horse Illustrated magazine. Click here to subscribe! I wish I understood changing leads better. great info, I think she explained it well. I really think all you need to do is use your outside leg more make him push his hindquarters over. They seam to be lacking in doing their part.